We are proud to offer the most complete selection of VW Interior Parts and Accessories in the Volkswagen Industry. As VW enthusiasts, we understand the importance of restoring your Volkswagen Type 3 (Squareback, Fastback, Notchback) just the way you want. That is why we offer the largest selection of interior upholstery materials and colors so you can restore your VW to stock or create a custom look based on your personal vision. We created the Complete Interior Kit for classic Volkswagens over 25 years ago. The kit bundles together all of the parts you would need to completely restore the interior of your VW Type 3. By purchasing all of the parts together in the kit, you will save up to $100 on your interior restoration. 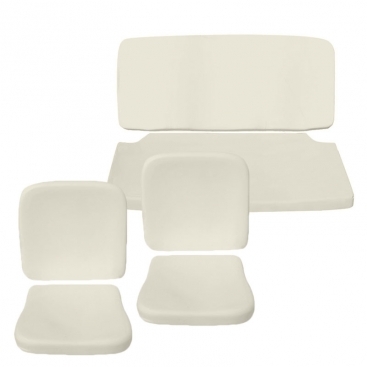 Our Volkswagen Seat Pad kits include pre-formed injection molded high density foam rubber that is designed to fill out your seat properly and last for years. Like our seat covers, our seat pads are made by TMI in the United States and guaranteed to fit your Volkswagen Type 3 perfectly. We offer VW Headliners in a variety of materials including original perforated vinyl, crush grain vinyl and mohair as well as custom materials such as tweed and velour. We offer stock headliners so you can restore your VW Type 3 to stock. We also offer custom headliner options so you can create your own look. Our selection of VW Headliners for the Volkswagen Type 3 includes a variety of materials and colors. Our VW headliners are made with anti-microbial treated thread which resists mildew and rot to keep you headliner tight and looking great for years. We offer TMI Carpet Kits and Pads for Volkswagen Type 3 (Squareback, Fastback, Notchback). Our VW Carpet selection includes quality Loop Carpet, Cutpile Carpet or the Original German Squareweave in wide variety of colors. Our carpet kits are made of high quality automotive grade carpet with a thick rubber backing. We offer front speaker kick panels as an option to upgrade the sound in your Classic VW Type 3. Speaker Kick Panels are mounted to the front inside panels of your vehicle and provide the best sound quality in your car. These heavy-duty fiberglass panels are painted black and can handle most 5 1/4" speakers as well as 6" low profile speakers. 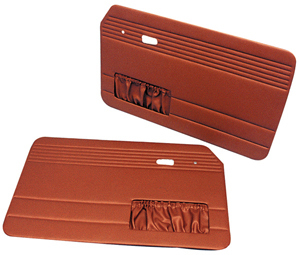 They can be installed either before the carpet or after the carpet has been installed. .
We offer a complete selection of Volkswagen Type 3 Sun Visors in vinyl or velour in a variety of colors to match your seat upholstery and headliner. Our Volkswagen Sun Visors are the finest on the market. All of our VW Sun Visors are made in the USA with the exclusive Jersey Spring Clip mechanism to keep your visor in the proper position and prevent it from drooping. We offer quality replacement VW Dashboards, parts, and accessories for the VW Type 3 (Squareback, Fastback, Notchback). Our VW Dashboards fit great and have the same texture, fit and padding as the original. These are the finest replacement Volkswagen Dashboards on the market. We do not sell poorly made, cheap dashboards because we know first-hand that they just do not fit. 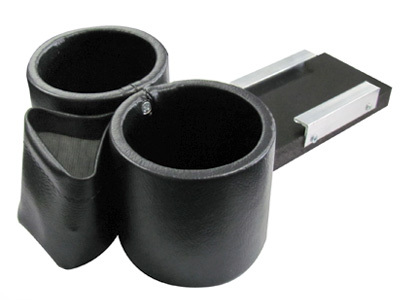 We offer a wide selection of Volkswagen Type 3 (Squareback, Fastback, Notchback) Cup Holders in your choice of styles and colors.